Meet Your Neighbor Tammy Smith who grew up in Danville, Iowa, the daughter of Terry and Marlene Wright. Terry is retired and Marlene has always been in food service and has been the head of the hot lunch program at the Danville school system for thirty one years. When Tammy was growing up they lived near Geode State Park in southeast Henry County Iowa where she learned to love hiking and exploring and all outdoor activities. She has two younger brothers. Pat was in the United States Navy for six years and remained in California after he was discharged. He returned to Danville not long ago and is a custodian of the Danville school system. Her youngest brother Jeff retired from the United States Air Force after twenty one years and lives in Rapid City, South Dakota. Tammy graduated from Danville High School and went to cosmetology school at Bill Hills College of Cosmetology in Ft. Madison, Iowa. She worked at the Hair Event on Central Avenue in Burlington for almost two years. She was a stay at home mom when her children were little. Tammy was a 4-H Leader and helper and rabbits were one of the kids 4-H projects. Her son Jared lives in Tampa, Florida. He was in the Air Force for six years and was in South Korea for a year and Qutar for six months. Before returning to the states he spent four years in Germany and was able to do some traveling around Europe. When he came back he was stationed at F.E. Warren Air Force Base in Cheyenne, Wyoming. He was a Security Police member and has a job in Tampa doing similar work. Security is needed everywhere. He has been able to take some college classes in his spare time. Tammy's daughter Jenna is married to Byers Wolf and lives in Burlington, IA. They just welcomed their new daughter into the family six months ago. Her name is Alison (they call her Ali) and is grandmas' very first grandchild. Byers owns a lighting company, "Energy Efficient" with two others. They do commercial and some residential in Burlington, IA and the surrounding area. Tammy met her husband Greg when a friend introduced them in Burlington and they were married in 2008. He is employed by Burlington Northern Sante Fe and works in Galesburg. Greg has two daughters. Joni lives in Bozeman, Montana and has his granddaughter Kaile and grandson, Zane. Joni is a part time veterinarian assistant and a full time Mom. Sara lives in Las Vegas and is a full time veterinarian assistant. The love for animals runs in the family. Greg and Tammy live on his family farm in northeast Henderson County. His father Robert is deceased and his mother Lorraine lives at Courtyard Estates in Monmouth. 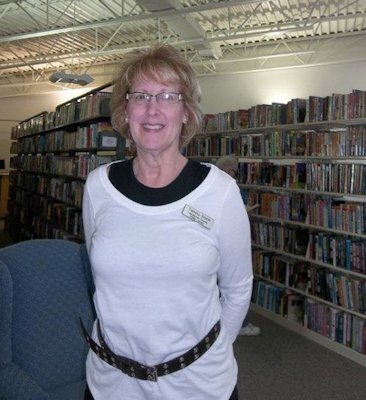 Tammy has worked at the Henderson County Library for two and a half years. She loves to read non fiction, Christian, true stories and history. The Bible is her favorite because it has everything! Tammy also loves to travel and has been to almost all the states, excluding a few in New England and Washington state. A favorite place is the gulf coast in Florida and she has all good memories of their time spent there. Of course when her brother was in California she visited and when Jared was in Wyoming, it was a good opportunity to see that part of the country. Travel is always better when you visit family! Greg and Tammy attend the First Christian Church in Monmouth and enjoy Sunday School class and Bible studies. She is very interested in missions and fellowship. God and people are supposed to be together.